Ice, Snow, Pause. A yearning for regeneration. A time to reflect the sun’s rays back upon the elemental components, the icicly-dangling drops, the whites and grays and blacks, the gaps of color, texture and pattern between each bead and within each negative-space. 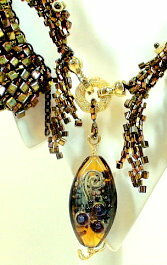 The cold touch of gemstone, glass and crystal. A time to jump cliffs and rebound with newfound energy. Feel your jewelry as it comes alive. And let yourself transform these winter days into creative splendor.